Just as we were landing in Hong Kong the views from the plane were breathtaking. I was so excited to arrive. We got picked up by Kevin who works in the surf summer camp and he took us to meet Dave who we were staying with. We had a few drinks in the pub, a chat then he showed us the house we were staying in. It's an old Chinese house so a different experience for us. Dave was really nice gave us so much information about Hong Kong and provided us with load of books. As we arrived late we didn't see the area we were staying in. It's called sai kung, beautiful countryside area just an hour from the busy polluted crazy city. I didn't even know this existed before I got here. We had the weekend to relax and had a little explore in Hong Kong central. Sunday is basically filipino day where all the helpers (the women who work at people's houses as maids, cooks, nannys etc) for a small wage hang out. It was interesting to see. 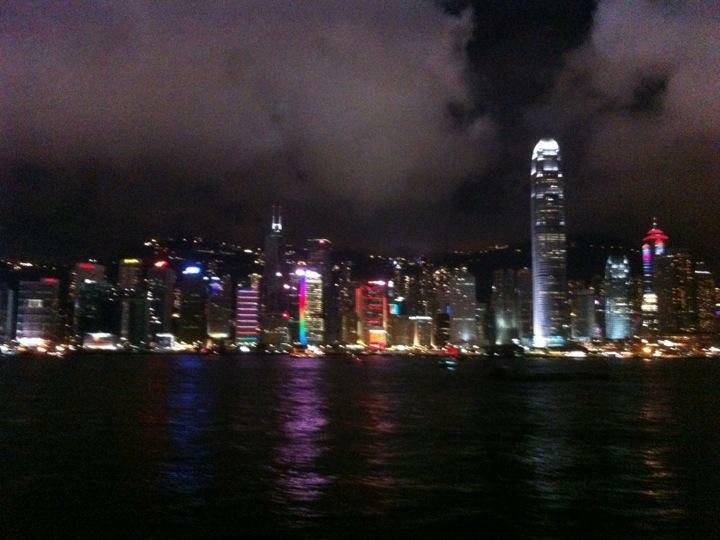 We had a walk around Hong Kong island and then toon the famous star ferry to Kowloon which was a lot more touristy. We had food at red ant restaurant, walked down avenue of the stars which was a mini Hollywood with famous Chinese celebrities stars on the ground and a statue of Bruce lee. So many Chinese tourists were there asking to take pics of us. We were such an attraction as they don't see people that look like us on a daily basis. We watched the symphony of lights free light show where all the buildings along the skyline light up and thy play music for the tourists every day at 8pm. We started at summer camp our first week volunteering was great. We had to trek an hour down to a little village called sai wan. The trek back up hill was really tough. The camp was based there and it has one of the most amazing beaches I have seen. The water was so clear and cool and easy to swim in. People came on their boats to relax snorkel etc. summer camp was cool we met the kids (spoilt rich kids) who were so different to any I have ever seen before. We prepared their meals each day and had to show them how to wash their dishes as they all have maids. It was crazy. We slept in tents on a camp bed each with a mozzie net over us each. It was a different experience to anything I had ever done before. The weather was perfect the kids went kayaking, canyoning, swimming, played on the beach too. We went to a waterfall with them which was nice with fresh water. We helped them surf and had a go ourselves. Angelica actually stood up on the board on the first day. While the kids were doing their activities we got on with our tasks, clearing rooms, tidying etc and then went for a swim each day taking a boogie board out with us. In the evening we would play bulldog on the beach just like when I was a kid and once we had a bonfire and toasted marshmallows with ghost stories. I had always wanted to do that. Around camp there would be wild animals roaming around so strange haha. The arrangement for us was a week at camp then a work off at the house etc etc. the walk back from camp uphill was hilarious and every week one kid would cry and whine the whole way. Back at the house we would usually take a day of to relax from a busy week. We would get all our food free. I cooked quite a lot, curry chicken, rice with prawns, pasta etc and Dave cooked aswell. Angelica made some great pancakes so we enjoyed the food. Dave set us up his laptops and a screen and provided us with a box of DVDs so we chilled out a lot. We explored more of Hong Kong and went to Kowloon again and done out own walking tour of the markets. We saw the famous night temple street market which was huge sold everything. We saw the bird market, goldfish market an the flower market too. Another day we spent in central and took the tram up the steep hill to the peak. The peak is an exclusive area where wealthy people live an from there you see the whole of the city. The view was amazing. Another day we went to another island called Lantau. This was really nice. We done a lot of walking. We went to a village called Tai o where we saw stilt houses, took a boat through the mangroves where the rare pink dolphins are. I was so happy we actually saw one and angelica got a picture of it too. We had some nice food there oyster baked with cheese was so nice. We took buses all around the island. We stopped at ngong ping village where the big bhudda statue is, the cable cars, the wisdom path and the piazza. We went to mui wo area where there's a beach and had food before getting the ferry back. We had 2 more weeks at camp. The next didn't stop raining so sucked for the kids as they couldn't do many activities and our last week at camp there wasn't many kids so we done more work on the shop, painting and clearing rooms etc. angelica got an amazing sunrise photo. As we worked so hard Dave paid for our visas so we can visit the country her loves so much China. We were so happy as we are so close to the border but wasn't even going to go there. We started researching a lot. Another day we went to Peng Chau island which was tiny but had a walk around anyway. Shatin was cool we went to the 10,000 bhuddas temple which had so many steps but was really different with loads of statues everywhere. Sai kung town was noce alot of expats live there. We done our food shopping there. The train system in hong kong is so clean. A few days left before we head to China.